Christmas is the season of giving, whether that’s giving presents to your friends and family, giving yourself permission to have that extra mulled wine at the market, or giving to charity. Obviously A Gift Card FOR Cardiff is all about giving, gift cards are nothing if not ready made presents, but this Christmas we’re going for an extra element and adding charitable giving into the bargain as well. 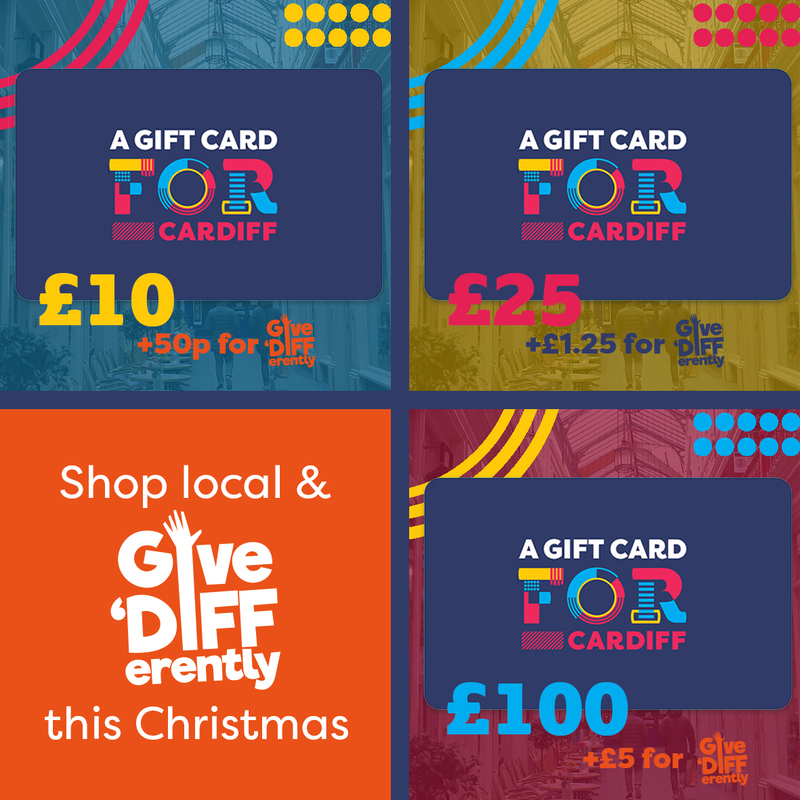 Throughout December whenever you buy A Gift Card FOR Cardiff directly from www.cardiffgiftcard.com or via our Facebook page, FOR Cardiff will donate 5% of the card’s value to Give DIFFEerently. Give DIFFerently awards grants to charities and organisations across the Cardiff area to help people move away from homelessness – you might have seen the campaign already in the summer with a contactless payment wall on The Hayes which was launched with help of local rugby legend Sam Warburton. Throughout December if you buy a £10 gift you still receive a £10 gift card but Give DIFFererntly also gets 50p. So not only are you supporting over 70 great independent businesses when you buy A Gift Card FOR Cardiff but now you’re supporting a great cause as well. Why not buy a card for everyone on your shopping list, then you can put your feet up and feel fantastic and come the January sales they can get on with the shopping themselves!